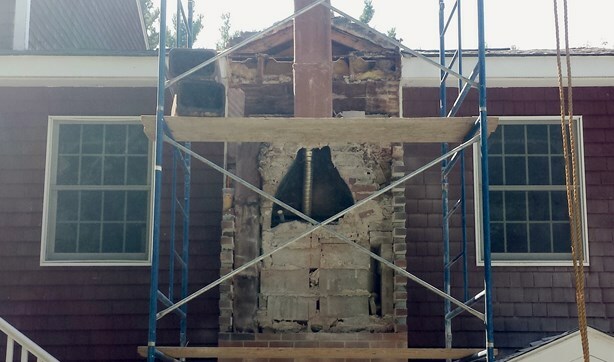 I would like to show how unfortunate it is to have an inexperienced chimney builder install a masonry chimney and fireplace on your home. 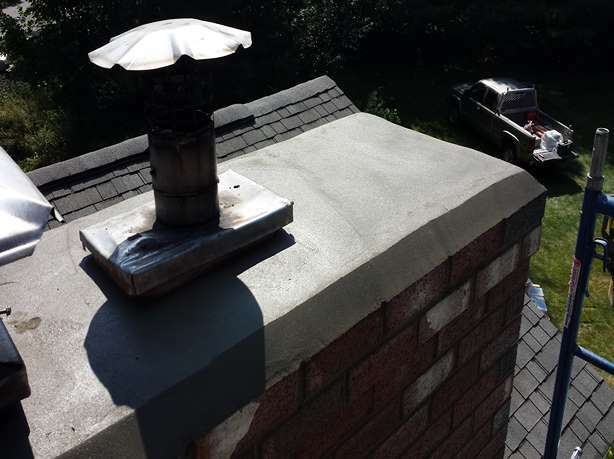 All in all building a proper chimney isn’t terribly complex, but certain things are easy to skip if your not dedicated to building quality, long lasting masonry chimneys. Lets face it the weather in the winter gets nasty and cold here in Massachusetts. Residents here need a chimney that will perform and last as these are not cheap either. Lets take a look at the top of this chimney. 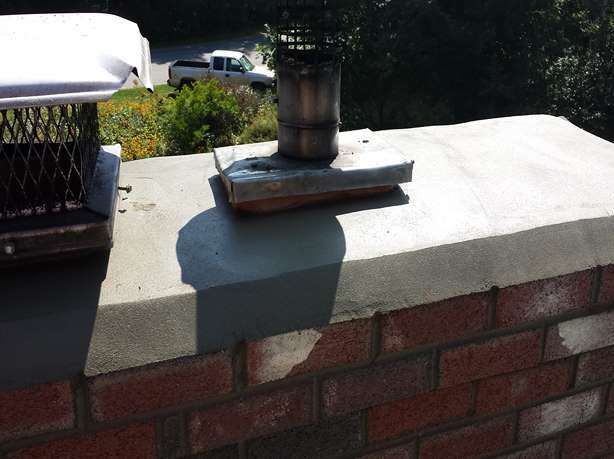 It appears to have been skimmed over once on the chimney’s crown, the concrete cap, by a company claiming to do chimney repairs. The repair was sub par, temporary and didn’t fix anything. The crown is compromised which allows water to get in -freeze and damage the top portion of the chimney. 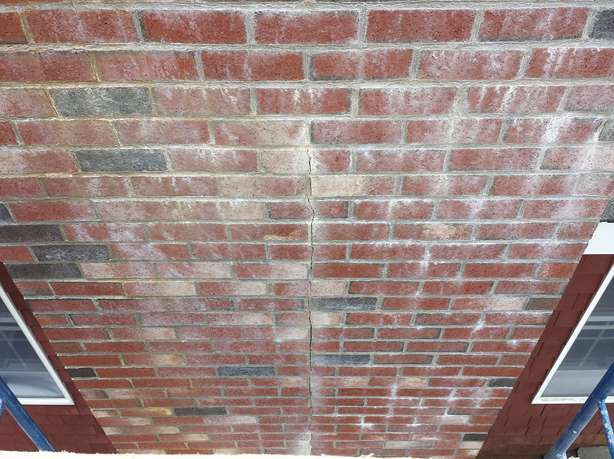 As you can see once water is allowed to enter at will the bricks and mortar separate and degrade sometimes quickly. If you see masonry around your house with moss on it, that is a warning that a lot of moisture is inside the bricks or stones. The white stuff on the bricks running down is called efflorescence. 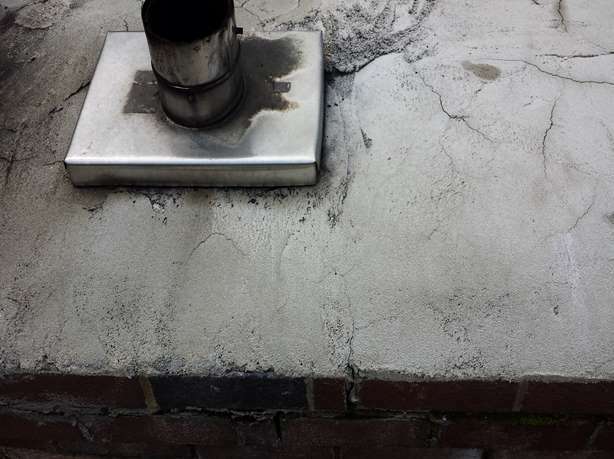 The chimney also has a large worrisome crack running down the face of it with more of that white chalky stuff which is an indication of a water problem. 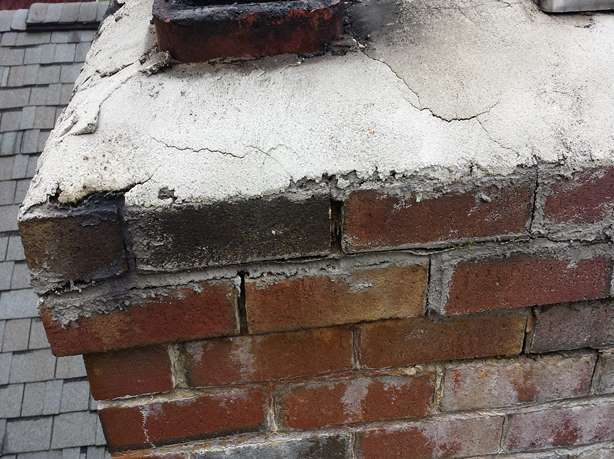 What is the repair solution for a chimney in such bad shape? Well it isn’t pretty. Take a look. I would like to pause on this picture for a couple of reasons. First this is only a 15 year old chimney and it is more or less being rebuilt from the fireplace area upwards. Do you see the opening that has a triangular shape to it? That is the smoke chamber. Improperly built. The mason relied on the outside veneer brick to be the wall of the throat. In many cases with a large crack running down the back of the chimney like we have on this one, most of the time it has a smoke chamber built like this. 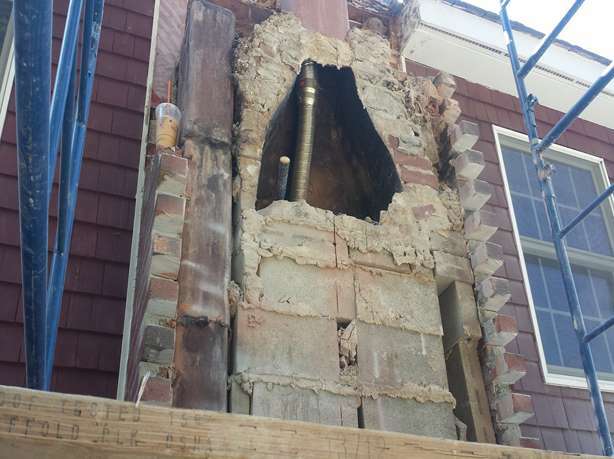 The Massachusetts building code requires 6″ of masonry until the first flue on an exterior chimney. It requires 8″ on an interior chimney. Long story short there is a missing wall that should properly support the fireplace flue, isolate the smoke chamber and its heat and expansions from the exterior brickwork. A pellet stove with a metal liner has been installed for the pellet stove insert. 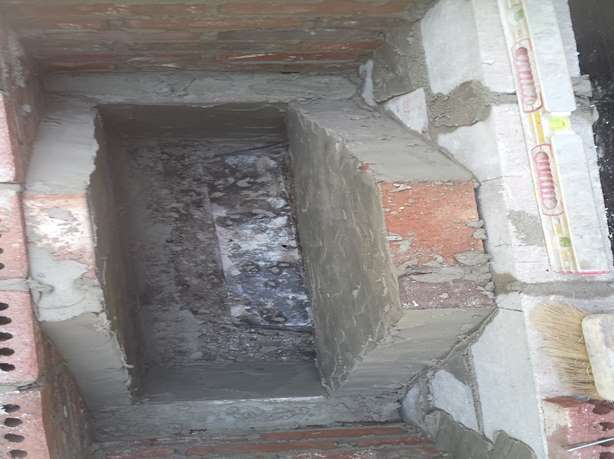 Here is a picture from another chimney showing how a smoke chamber should be constructed. It is also worth pointing out that there is no moisture barrier (tar paper minimum) between the chimney and the side of the house. After a few days we completed a proper crown on this chimney ensuring that it will last for many many years to come!